Has anyone had any experience with adding sound to model buildings? I'd like to add some basic saloon type sounds to a building as well as recreate the "ticking" of the telegraph machine in the train station. I'm toying with the idea of using a inexpensive blue tooth speaker synced with a playback source such as an iPod or other type of mp3 player. I have a small digital music studio out of my home so am fully capable of looping tracks and sound effects. I'm just looking for the pros and cons of doing it this way. I think you can find inexpensive players that read from an SD card. I would not want to be adding multiple bluetooth music streams and have to maintain the radio links. If you can find one that auto starts on powerup that would work well... I know they are out there and cheap. I use a computer speaker system with one speaker in the main station that plays station-type sounds (carts, dogs, people, etc.) and the other speaker in the water tower (engine yard and machine sounds). These are connected to an MP3 player. I made a 300 second stereo loop in Audacity taking sound bites from the 'net back when you could easily download them. I split this into ten 30-second sections. When a train pulls into the station, it's magnet retriggers a reed switch tied to the sound loop, beginning at any of the 10 segments at random. It will then play up to 300 seconds, then shut down, starting at that point in the loop. This keeps it from getting boring. Also, it doesn't take 300 seconds for a train to go around the loop, so without this "random start" it would be the same sounds each time the train returns. I got the MP3 player from Dave Bodner. It was his prototype and can do as many as 80 random start points (eight banks of 10). We also have an MP3 player that plays "The Low Rider" (like 6 different versions) as well as other "War" and "Cheech and Chong" tracks in the station where the Low Rider train parks. The amp gets its power from the rails, so it only plays when the trains run, though the MP3 player loops continuously throughout the day until I turn it off or it runs out of charge. Sometimes, the Jazz band plays in the town square (cassette player) and the singer sounds exactly like Aretha Franklin. Finally, somewhere along the line I picked up a telegraph sound module. The telegraph message is the same as the one you would hear at Dizzyland in Anaheim. Went to Office Max back-to-school shopping with my son yesterday and found an Ativa wireless blue tooth speaker on sale for $6. Sounds great for the application that I plan on doing. Battery is rechargeable and only lasts 2 hours...but at this price I figured I could by several back ups and with the use of velcro swap the speakers as they need charging. The speaker also uses an SD microchip so I don't even need to blue tooth it. Ordered 4 16gb cards on Amazon which should be here Monday. I found the telegraph sound from (as Todd Brody calls it "Dizzyland") and plan to loop it adnausium. 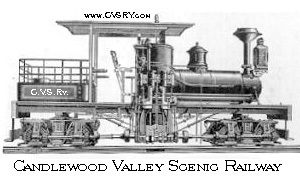 For the "saloon" I'm going to mix a few tracks of ambient chatter with some ragtime piano playing...think it will sound pretty good when done. Cool Richard. Great idea. I have some other ambient noise Ideas I'd like to use around the railroad. I could find players for under $2 but could not tell if they would "auto start"... so the speakers will play from the SD card? Great. I had a cheap player that would not auto-start. So I made a 555 timer activate a solonoid that would physically "punch" the switch to make the track start. That worked fine. The problem then became that each time it would start, it would revert to a reduced volume setting that was too low to be practical for the application. That's why I went to the player that just continues to play throughout the day. Richard - Your posting got me thinking about an inexpensive way to add sound effects to buildings. I have been using a very capable & inexpensive MP3 board, called the DFPlayer, in a host of projects. Normally you connect it to an Arduino, PIC or other microcontroller but it does have a mode that works with minimal components. I put together a very simple way to use the DFPlayer without soldering or any exotic electronics. The player sells on Amazon for less than $10 and for much less on eBay. If you have a good "junk box" of parts you need little more than the board & an old MicroSD card. Here is a picture of what I'm playing with. The blue tooth speaker was $6 at Office Max. I purchased a few SanDisk micro SD chips and some velcro. 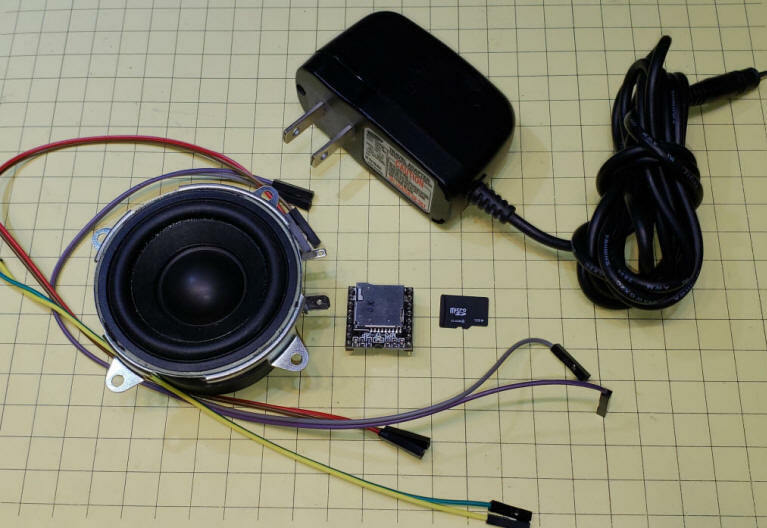 The SD chip goes into a slot in the speaker and plays. Since there isn't any volume control using the chip I have to test mix my sound sequences in my studio computer. But the speaker is battery powered and rechargeable and lasts 2 hours. I picked up a total of 4 speakers and figured I could swap out one speaker for a charged backup using the velcro. I'll outfit the other two with some sounds for the train station. Will see how it all pans out. But pretty inexpensive and no wiring. Nice solution, Richard - strange that there is no volume control when they allow you to play from an SD card. G-Scale Graphics now offers a Sound Clip Module with a library of sounds to choose from or we can program it for any mp3 file of your choice. Trigger it once, or play in a continuous loop. Thanks for the link Del. I found a really cool Christmas player piano collection on iTunes...purchased and threw it in my digital audio workstation and created a long loop that runs about 4 hours. I loaded that on the micro SD Chip that goes in the Bluetooth speaker. At our open house I discovered the little Office Max speakers ran for 3 hours on a charge. I have a two backups fully charged in case we run longer than 3 ours. Lot's of fun and really adds the layout.